Annual release showcases new custom location and route management web tools for precise mileage and drive times. 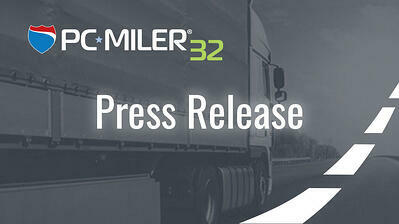 Princeton, N.J. – September 18, 2018 – ALK Technologies, a Trimble Company and global leader in transportation technology and mobility solutions, announced today the release of PC*MILER® 32, the latest version of its PC*MILER truck routing, mileage and mapping software. Creation and management of two of our most popular features, Places and Route Modifiers, has moved from within PC*MILER to ALK Content Tools. Users can continue to save and quickly access frequently geo-coded business or stop locations when route planning, as well as modify routing preferences by avoiding or favoring road segments. With migration of these management features to the web, this content no longer needs to be manually backed up or moved locally between versions. In addition, it can be more seamlessly shared across multiple users on a company account. Located in ALK Content Tools, customers can enhance their custom Places by drawing a boundary polygon around a site perimeter and adding truck entry and exit gates. As variance between street addresses and actual entry and exit locations may differ greatly, Site Manager can dramatically improve the accuracy of mile and cost calculations, directly affecting rates, billing, and driver pay. Equally important, a defined site provides more granular turn-by-turn directions to help keep drivers safe and alleviate stress when approaching and departing a destination. ALK’s cloud-based ecosystem of web tools allows users to create, manage and share custom location and route management content across licensed ALK products, including CoPilot® Truck in cab navigation, for improved operational consistency from the back office to the vehicle. Now, customers can more quickly generate PC*MILER’s popular Mileage report for trip leg and overall miles and immediately view the additional distance impact when inserting a stop along a route. Additionally, customers can more easily create or modify a route by quickly inserting multiple stops at once using the new Quick Add Stop Entry feature. With each release, ALK’s team of map data experts add new highways and local roads along with commercial vehicle restrictions and allowances, as well as new construction projects. Also, specialized Places, including Distribution Centers, truck stops, and rest areas are added to ensure safe and efficient routing while getting the most precise mileage. PC*MILER runs on Microsoft Windows, IBM AS/400 (iSeries), and mainframe computers, is also available as a web-based application, and can be seamlessly integrated with transportation and supply chain management systems. Some services mentioned may require additional licensing. For more information on PC*MILER visit our website: www.pcmiler.com. For PC*MILER 32 images, click here. ALK Technologies is a transportation technology company dedicated to defining the optimal route to success through innovative routing, mileage, mapping and mobile navigation solutions. From trusted industry standard data to seamless integration, ALK solutions are developed for a broad range of industries, workforces, and everyday drivers on the road. For over 35 years, its suite of powerful solutions, including PC*MILER, CoPilot, and ALK Maps, have set the foundation for safe and efficient journeys worldwide – one mile, one driver, one vehicle at a time. ALK is a Trimble (NASDAQ: TRMB) Company and part of its Trimble Transportation division. To learn more about ALK, visit www.alk.com.